A couple weeks ago I had the opportunity to test out a new fitness studio in Toronto thanks to my colleague, Heather, who also writes the fitness blog, RunSoulCycle. 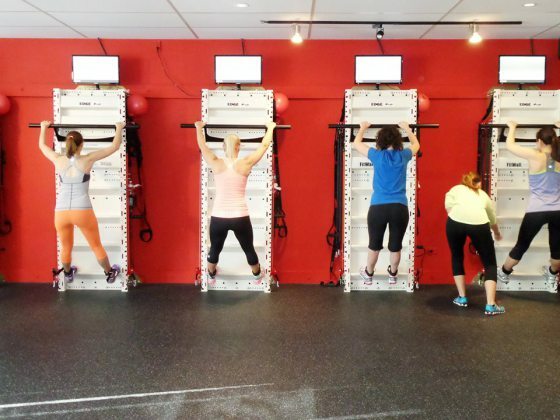 Fitwall Leaside utilizes a vertical training system to focus on increasing muscular strength, coordination, balance, and core stability. Basically you are working out while griping a tiny ledge and balancing on a small step to incorporate as many muscles in single movements as possible. I haven’t exactly been active recently. I’m ashamed to say it’s been a while since I’ve gotten in a good sweat from working out. Not to mention none of my previous workout clothes fit anymore. I felt like a bum in my baggy t-shirt and old track pants cut into capris! Heather is nothing short of a fitness pro-star whose fitness resume is more than intimidating… marathon runner, indoor cycling instructor, yoga lover and triathlete. My fitness accomplishments within the last 6 months include occasionally taking the stairs rather than the elevator, chasing after the girls, and walking L to swimming! Once I was there, I relaxed and tried to enjoy the experience as much as I could. So, would I go back? Not at this stage in the game. I think I would have seen amazing results if I’d stuck with it but I’m just not there yet to be able to give it my all. I may give it another shot when I’m at a higher fitness level. However, I would definitely recommend it to someone who loves to sweat and is looking to try something new! I would love to start running. It’s just a matter of finding the time and the motivation! I’m going to work on the treadmill this winter and then take it outside in the spring! That’s exactly how I started! I don’t like running outside in the winter so I bought a treadmill for the basement, then by spring I was hooked and signed up for a few races. I’m excited for you!